My series on the top ten goal scorers in every NHL arena continues with the Ottawa Senators. 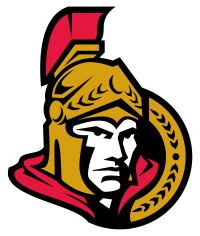 Although the current Ottawa team was established only in 1992, Ottawa was one of the founding members of the National Hockey League in 1917. The original Senators played in the National Hockey Association, and in several other leagues before that. They played NHA and NHL games in the Ottawa Arena from 1917 to 1923, and the Ottawa Auditorium from 1923 until 1934. The current Senators team played in the Ottawa Civic Centre until 1995, and currently plays in Scotiabank Place. The first NHL game was played in the Arena on December 19, 1917. The Arena was used until the end of the 1922-23 season. The last regular season game was played on February 28, 1923. Cy Denneny 95 All with Ottawa Senators. Frank Nighbor 54 All with Ottawa Senators. Jack Darragh 48 All with Ottawa Senators. George Boucher 44 All with Ottawa Senators. Punch Broadbent 43 All with Ottawa Senators. Eddie Gerard 37 All with Ottawa Senators. Joe Malone 20 11 with Montreal Canadiens, 5 with Hamilton Tigers, 4 with Quebec Bulldogs. Reg Noble 17 All with Toronto Arenas/St. Patricks. Corb Denneny 16 All with Toronto Arenas/St. Patricks. Sprague Cleghorn 14 11 with Ottawa Senators, 3 with Montreal Canadiens. The highest scorer by far was Cy Denneny, one of the most prolific scorers in the early NHL. His brother Corb, who played for Toronto, is also among the top ten (the brothers are also both among the top ten scorers at Arena Gardens, Toronto’s first NHL arena). The highest scoring player who never played for Ottawa is Joe Malone, another one of the early NHL’s top scorers. The Auditorium replaced the Arena in 1923. The first game was played on December 15, 1923, and the last on March 15, 1934. Cy Denneny 53 All with Ottawa Senators. Frank Finnigan 53 All with Ottawa Senators. Hec Kilrea 48 All with Ottawa Senators. George Boucher 31 All with Ottawa Senators. King Clancy 31 30 with Ottawa Senators, 1 with Toronto Maple Leafs. Frank Nighbor 23 All with Ottawa Senators. Bill Touhey 23 All with Ottawa Senators. Joe Lamb 20 All with Ottawa Senators. Hooley Smith 18 17 with Ottawa Senators, 1 with Montreal Maroons. Syd Howe 17 16 with Ottawa Senators, 1 with Pittsburgh Pirates. 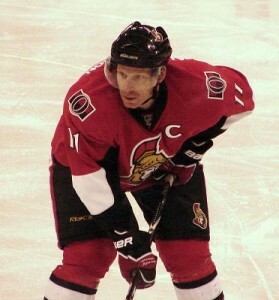 Daniel Alfredsson has scored 222 goals at Scotiabank Place. The Senators had financial problems throughout the 1920s and 1930s, and they did not play the 1931-32 season. They also played some of their home games away from Ottawa in an attempt to collect more money from ticket sales. They played home games against Detroit at the Red Wings’ Olympia Stadium (December 31, 1927, March 10, 1928, November 24, 1928, February 9, 1929, November 26, 1929, March 8, 1930, February 5, 1931, and February 10, 1934), against the New York Rangers at Madison Square Garden (March 17, 1931), and against the Toronto Maple Leafs at Arena Gardens (March 21, 1931) and Maple Leaf Gardens (January 14, 1933). They also played home games at Boardwalk Hall in Atlantic City, New Jersey, against the New York Rangers (December 28, 1929) and the New York Americans (March 15, 1930). The totals for most of the top ten would be slightly different if they had played these home games in Ottawa. Frank Finnigan, for example, would have been the top scorer, as he had five more goals at Ottawa home games in Detroit. The highest scorer who never played for Ottawa is Nels Stewart, with 12 goals (9 with the Montreal Maroons and 3 with the Boston Bruins). After the 1933-34 season, the Senators moved to St. Louis, where they played in St. Louis Arena. The St. Louis Eagles lasted only one season before folding. The NHL returned to Ottawa in 1992. The re-founded Ottawa Senators played at the Civic Centre from October 8, 1992 until December 31, 1995. Bob Kudelski 29 28 with Ottawa Senators, 1 with Florida Panthers. Sylvain Turgeon 26 All with Ottawa Senators. Alexei Yashin 26 All with Ottawa Senators. Alexander Daigle 18 All with Ottawa Senators. Randy Cunneyworth 12 10 with Ottawa Senators, 2 with Hartford Whalers. Dave McLlwain 11 All with Ottawa Senators. Jamie Baker 9 8 with Ottawa Senators, 1 with San Jose Sharks. Jody Hull 9 7 with Ottawa Senators, 2 with Florida Panthers. Andrew McBain 9 All with Ottawa Senators. Andrei Kovalenko 8 7 with Quebec Nordiques, 1 with Montreal Canadiens. Mark Lamb 8 All with Ottawa Senators. Norm McIver 8 All with Ottawa Senators. Ottawa played two home games away from the Civic Centre, in the era of the NHL’s “neutral site” games in the early 1990s. Kudelski and Hull scored one goal each in Saskatoon, February 23, 1993, and McLlwain scored in Minneapolis, March 4, 1994. The highest scorer who never played for Ottawa is Andrei Kovalenko. The first game at Scotiabank Place was January 17, 1996. The arena was originally called The Palladium, and then the Corel Centre until 2006. Active players as of the end of the 2011-12 season are in italics. Daniel Alfredsson 222 All with Ottawa Senators. Jason Spezza 107 All with Ottawa Senators. Alexei Yashin 102 101 with Ottawa Senators, 1 with New York Islanders. Mike Fisher 92 All with Ottawa Senators. Dany Heatley 92 91 with Ottawa Senators, 1 with Atlanta Thrashers. Marian Hossa 92 90 with Ottawa Senators, 1 with Chicago Blackhawks, 1 with Atlanta Thrashers. Radek Bonk 86 85 with Ottawa Senators, 1 with Montreal Canadiens. Shawn McEachern 71 69 with Ottawa Senators, 1 with Boston Bruins, 1 with Atlanta Thrashers. Wade Redden 56 All with Ottawa Senators. Martin Havlat 52 51 with Ottawa Senators, 1 with Minnesota Wild. Alfredsson has scored all but one of his home goals at Scotiabank Place. His first goal at home in his rookie season was scored at the Civic Centre. Ottawa played one home game in Stockholm as part of the NHL Premiere series of games in Europe, on October 4, 2008. Spezza and Heatley both scored in that game. The highest scorer who has never played for Ottawa is Ilya Kovalchuk, with 13 goals (12 with the Atlanta Thrashers, 1 with the New Jersey Devils). For 1917-18 to 1925-26, I used the game logs at the Hockey Summary Project. For 1987-88 to the present, I used the “play finder” at Hockey Reference to find goals scored at home. For 1925-27 to 1933-34, I used the game logs in contemporary newspaper reports from the Google News archive. All game results can be found using a combination of the Montreal Gazette, the Ottawa Citizen, the Border Cities Star, the Pittsburgh Post-Gazette, the Pittsburgh Press, the Calgary Daily Herald, and the Saskatoon Phoenix.